Lord Cypher - keeper of secrets & traditions. This is another test model for my command squad. I didn’t like the original GW Cypher model so I converted my own. 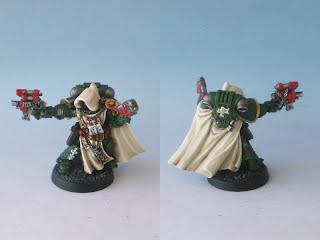 I bought a box of the fine cast black templars veterans or command squad box to rework them into the “inner circle” of my dark angels army. The hood is my first attempt at sculpting to add to the mysterious feel of the Cypher character. Any ideas for a suitable “broken sword”? Well the sword he carries is meant to be either the fabled 'Lion Sword' or the 'Sword of Luther'. It is never drawn so you can't use it in combat although he did once carry a C'tan phase knife but he lost that during the 13th Black Crusade. So that would depend on at what point your Cypher is based. I would say use the scabbarded sword off the real Cypher model as it looks pretty cool even if you don't like the rest of the model. Remember he doesn't wear a helmet and his backpack vents have metal "wings" on the side. Looks very cool though dude. I need that backpack!!! Anyone have a cypher model they don't need?